At Washington-Dulles airport, I had just a few minutes to pop into the United Club. First order of business was asking the agent there if I could switch to a different aisle seat, which at the moment appeared to have an empty seat between me and the other passenger. She said that the flight was going to leave with a few seats open, so it was worth a shot to change the seat. Done. Then it was on to the food. And I scored with some of my favorites! The soup of the day was the “fiesta chicken” soup, which is kind of Mexican-inspired, I suppose, with a decent kick. Along with soup, I took some corn bread, pepper jack cheese (I do miss this when I’m outside of the US), plantain chips which taste just like potato chips (but I pretend they’re healthier), and a brownie. They also had Coke Freestyle machines here, so I got something that was like pink lemonade, I think, but it was vile and very artificial-tasting. Taking me to Frankfurt today was a Boeing 777-200. This was an older version, still with United’s old 2-4-2 business class with rear-facing seats. While not so great for business class passengers, we Economy passengers have to enjoy it while it lasts. 3-3-3 seating, rather than 3-4-3 seating in the newly reconfigured versions. Then for dinner, we had three choices. Again! There was Indian butter chicken, spinach manicotti, and “vegetarian.” I peered onto the top of the cart with the piles of main courses, and I saw that the cover of the vegetarian dish had the “Rajbhog Foods” logo on it. 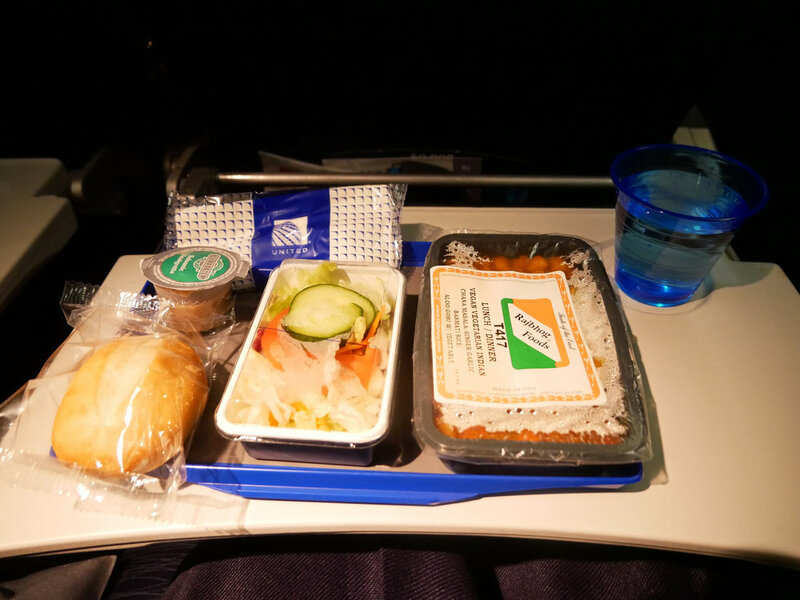 They’re also the supplier of the butter chicken entrees, which I love, so I knew that this Indian vegetarian entree would be good too (turns out they’re not only an airline caterer, they also have restaurants and retail stores around the country!). I’ve said it before, and I’ll say it again, I really love that United has non-pasta vegetarian options, and that they also have lots of spicy Asian and Indian meals on offer! Sometimes the non-pasta vegetarian option will be hidden away, so my advice is to ask! This Indian vegetarian dish contained chana masala (chickpea curry), “ginger garlic” basmati rice (according to the label, though I didn’t detect much ginger or garlic), and aloo gobi (potatoes and cauliflower). This was actually my third night in a row eating Indian food, and I was very happy about it! Even though it got a bit dried out, the dish still wasn’t dry, and the curries were still robust in flavor. Plus all of those chickpeas and potatoes and rice were quite filling. The industrial white roll and the iceberg lettuce salad were rather forgettable. Then dessert was a lemon sorbet. I read the ingredients label and was pleasantly surprised that there were very few - it’s quite a clean list. But I just don’t really like sorbets in general, and lemon sorbets even less (which is strange, since I like lemonade and lemon water). I just ate a few spoonfuls of it. I watched A Quiet Place, slept a bit, got hungry and got some pretzels in the galley (desperate times! ), and then watched some episodes of The Americans. Then the flight attendants rolled around with breakfast. I am so happy that United now serves Chobani rather than the very artificial-tasting Upstate Farms. Along with the yogurt, we got a warm croissant, which I’ve found that I enjoy when dipping into the tomato juice! Kind of like tomato soup and bread, or Spanish toast with grated tomato. After trays were collected, we landed in Frankfurt where it was already the morning.